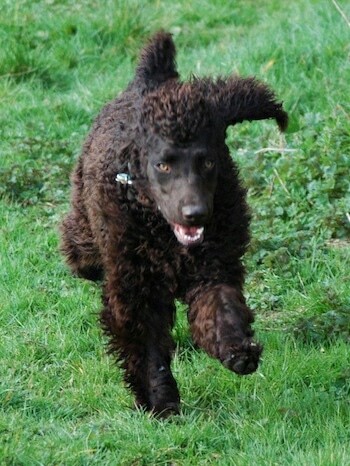 Bowe the Irish Water Spaniel at 9 months old—"Bowe is our lovely Irish Water Spaniel from Belfast, N. Ireland. He is a very friendly, loyal and comical curly haired family dog. He is also enjoying gun dog training. He is fabulous with my husband and son as they have dog allergies and asthma and they have no problems with Bowe's ringlets. It's so nice to finally be able to enjoy a family dog. We do watch Cesar regularly and try to apply his logic of balance for the dog. Bowe is an energetic dog and he gets an hour of active exercise a day and a further short walk in the evening. 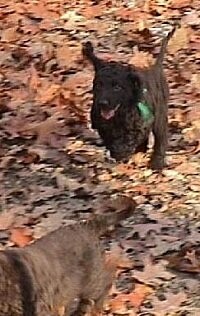 We find him easy to manage so long as he gets a good free run. We also regularly socialise him to people, dogs and animals; he is friendly to all. They are slow to mature dogs and as they are extremely friendly and medium height dogs, they may suit slightly older children. My kids were 9 and 12 when we got him." 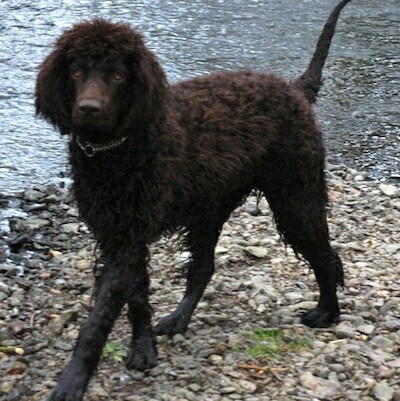 The Irish Water Spaniel is the largest of the spaniels. The head is large with a long, square, deep muzzle, and a gradual stop. The large nose is dark liver in color. The teeth meet in a scissors or level bite. The small, brown eyes are almond-shaped. The long ears are set low, hanging close to the head and covered with loose curls. The chest is deep, but narrow. The front legs are straight. The hindquarters are as high as or slightly higher than the shoulders. The webbed feet are round spreading, covered with hair. The tail is low-set and carried level with the back. The coat is covered in long loose curls on the body and shorter hair on the face and tail. 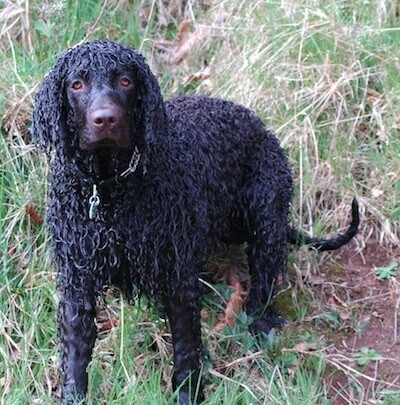 The curly outer coat has a dense undercoat that insulates the dog from cold water. There is a topknot of curls on top of the head. 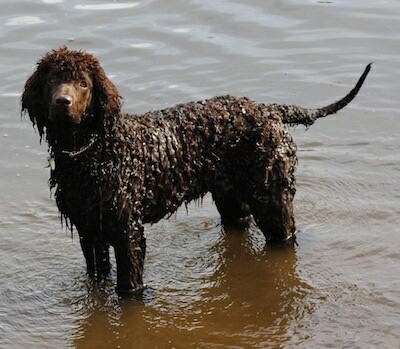 The Irish Water Spaniel is intelligent, devoted and spirited. Self-assured, eager and willing with a desire to please. Clever and capable of learning a great deal. A loving family dog. With enough mental and physical exercise and owners who convincingly display a natural, firm, confident and consistent leadership over the dog owners will find it to be mild-mannered and docile. Can do well with other pets if properly introduced. Can be reserved with strangers. Should be well-socialized as a puppy and does best with children who know how to be little pack leaders. The Irish Water Spaniel is a quiet dog, barking only when necessary to warn the family, making a good watchdog; some can act as a guard dog. Hardworking in both the obedience ring and on the hunt, this breed lives for a job to do. An excellent swimmer, he has considerable stamina and drive, and a very good nose. If this breed senses its owners are meek or passive it can become stubborn, mischievous, timid, nervous, suspicious, and/or even overprotective, thinking it needs to start making up its own rules, as it will not feel its owners are strong minded enough to keep the pack stable and safe. It may refuse commands from family members who have not established leadership over it. Requires an owner who understands proper human to canine communication. This breed may drool and slobber. Prone to hip dysplasia, hypothyroidism, eye entropion and ear infections. Because he needs plenty of daily exercise and loves the outdoors, he does best in the suburbs or country. This breed does best with at least an average-sized yard. These are hunting dogs with tremendous stamina. They need a daily long,brisk walk, jog or run. While out on the walk make sure the dog heels beside or behind the person holding the lead, never in front, as instinct tells a dog the leader leads the way, and that leader needs to be the human. In addition, they will greatly enjoy retrieving and swimming. The coat needs to be trimmed regularly. It mats easily and needs to be combed once a week. Is often good for allergy sufferers because they have relatively less dander than other breeds. These dogs shed little to no hair. 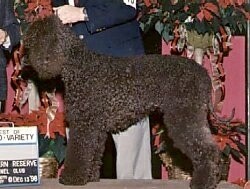 A man by the name of Justin McCarthy from Dublin, Ireland is credited for creating the Irish Water Spaniel breed. 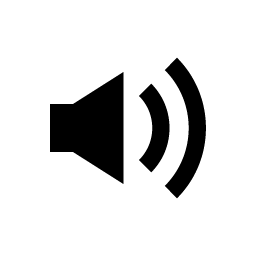 While he left no breeding records, it is said the breed may be comprised from Poodle and Irish Setter, or the Poodle and the Curly-Coated Retriever or the Poodle and the Portuguese Water Dog, or possibly a combination thereof. In appearance, the dog resembles a brown Standard Poodle. The dogs were used as dual-purpose hunting dogs, working both land and water, with a soft mouth, able to retrieve even in frigid waters. In the 1800s the Irish Water Spaniel was popular in the United States as a duck hunting dog. Unfortunately the breed lost popularity when the easier care Labrador Retriever became more popular. 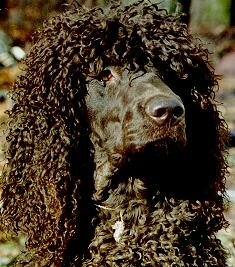 The Irish Water Spaniel is now considered a rare breed. 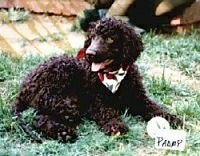 The Irish Water Spaniel was recognized by the AKC in 1884. 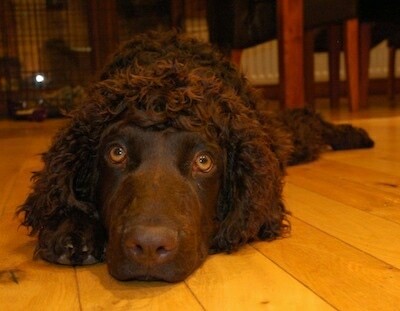 "Miss Ladida (pronounced La-dee-dah) is an Irish Water Spaniel at 5 years old. She is an amazing clown, and the smartest dog you can imagine. She is almost too smart for her own good! Ladi's grandma Lois, who is a skilled amateur photographer, has literally taken thousands of pictures of Ladi, including this one. Ladi has an extensive wardrobe and enjoys dressing up for the camera—or, indeed, any other time. She allows her teeth to be brushed with an electric toothbrush (I work for a veterinarian and have NEVER heard of any other dog allowing this), knows all her toys by name, and knows an amazing number of tricks."